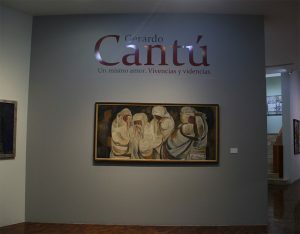 Without him knowing, or quoting from it, the Cannibal Manifiesto (São Paulo, 1928) gives aesthetic sense to the work of Gerardo Cantú exhibited at Museo Mural Diego Rivera under the title Un mismo amor. Vivencias y videncias. Among the phrases adroitly sprinkled here and there to accompany the works, there is one highlighted in red on the triptych that substitutes the catalogue: “with Cantú we arrive at the awkwardness of love, but love still, and perhaps a love more sincere and higher than that which the romantics exalted in their time”, says Ida Rodríguez. Drawings, sketches, litographs and paintings, give an account of everything that has nurtured sixty years of work and the construction of social relations to appropriate and enrich his own sense of self. He is remembered imitating his teachers, gesturing and talking like them, restating their proposals, quoting one to reference another. This festive appropriation accompanies the development of all the technical resources needed to produce works in which the identities of those quoted in them disappear, giving way instead to a complexity culminating in a dialectical synthesis. This is exactly what the Cannibals proposed: devouring everything to remove the surplus and the waste. There is, for instance, Orozco’s claim that Diego Rivera is a painter of buttocks. Gerardo Cantú exhibits four small drawings as a literal tribute, as an abstraction of a statement which is irrelevant for the major works, except as an instance of the need to take notes along the paths of life in order to follow one of Rivera’s recommendations: to carefully file the results of this aesthetic practice as care of the self. Festive works predominate, rich in pictorial and graphic resources to the point of doing away with expressions in the faces, with fixed, front-looking eyes and features that are neither ugly nor beautiful, except in those portraits with textures and colors, and with eloquent hands in some of them, as a reference to the model signified by a particular object as in Renaissance portraiture. Roxana’s portrait, for instance, is beautiful and serene, the trace of the arms culminating in the hands, depicted as the endpoint of rest and peace. Self-portraits are made according to his age, with the necessary materials for modelling, indicating the beard, the hair, the eyes, without any further references; all that is redundant vanishes under the dry brush, as Arturo Cantú clearly states. Quite another thing are the still lives, where colorful matter builds a space in perfect harmony with fruits, flowers, objects. This pictorial simplicity, without any vain showing-off of his skills as a draughtsman, renders a placid vision of the coming together of fruits and objects. A lover of flowers, he uses them as signifiers; of a couple, for instance, kissing each other, hands entwined, the woman clambering up as if she had come running towards her partner. The hardness of the dry brush is subdued by tenderness. 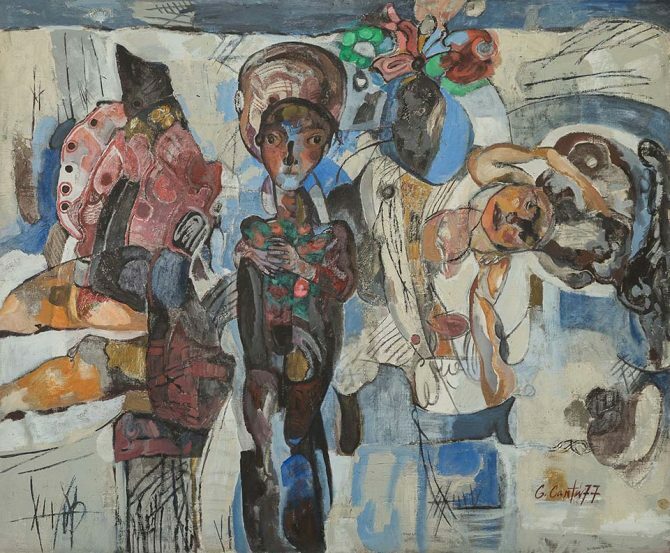 Without the need for naturalist figuration, Gerardo Cantú succeeds in his “constant search for a Humanism suited to the present hour”, as Raquel Tibol points out. A humanism that differs from the epic of the Mexican School of Painting, from its heroes and martyrs, its peasants and workers, its rulers and tyrants. Close to the Mexican Communist Party, influenced by Rivera, O´Higgins and Méndez, Gerardo Cantú went to Prague on a grant, got to know “real existing socialism”, lived through the de-Stalinization process, and has lived long enough to witness the rejection of the cult of personality as stated by Fidel as his last will. All of this contributes to the construction of a much-needed humanism, without any manifest destiny, any meta-historical finality or any divine-like redemptive subject. Instead of this, “the same love” for a humanizing process built upon living experiences, and seeing experiences too, beyond rationalist narratives, vindicating the pleasure instinct, pointed out by Marines Mederos when he says: “furious, anxious love, impossible to hide beneath good sense and opportunism”. The varied techniques are remarkable in their fortunate appropriation by the artist. 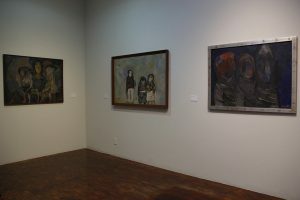 There are oils, acrylics, resins, inks and metal engravings, charcoal and dry brush drawing, and a triptych sample of one of his murals at Universidad Autónoma de Nuevo León. Referencing his mural about Fray Servando Teresa de Mier would not have been amiss, as it matches the luminous sense of life laboriously built by the friar who escaped from several prisons, shaped the Mexican Federal Republic and fostered revolutionary internationalism along with Francisco Javier Mina —a combatant against dictatorships and monarchies— with whom he disembarked clandestinely in Mexico. This narrative detour is unavoidable to fully grasp Gerardo Cantú’s elective affinities. The compositions build complex spaces with varied perspectives, ranging from those suggested by the Renaissance to views from above to portray events in detail. This complexity implies dislocating the ensembles, including incongruous allusions, such as painting the Cerro de la Silla in a Last Supper scene, or those little still lives painted as a cultural knowing wink. Their eroticism is not obvious. The large paintings dedicated to La Celestina, depict her as a serious-looking woman, guarding over the fully dressed but intertwined couple. Susana y los viejos shows the defamed young woman sleeping, her naked body spilled over a white fabric, surrounded by the gawking old men. There is this same implicit eroticism in Las tentaciones de san Antonio. Irony is a valid resource in painting when it does not illustrate any literary narrative, as in El ojo de la aguja and Las señoritas de Monterrey, without any particularities in their dresses, highlighted over a stripe at the level of their torsos, as a sort of sustaining churriguresque labyrinth. There is some of Fanny Rabel’s presence shared by Gerardo Cantú in Réquiem por una ciudad. “Higher and more sincere”, in Ida Rodríguez’s words, is Gerardo Cantú’s love, drawn out to a Requiem por Cristo, massacred by lances, shrouded in shadows but lit by the moon. The painting itself shimmers. Each painting, drawing and engraving is full of grace. Aesthetic praxis transforms and gives rise to a tender pleasure and, sometimes, to a contented smile. Sixty fruitful years, materialized in an oeuvre that well deserves to be fully registered in a catalogue. Gerardo Cantú’s exhibition, Un mismo amor. Vivencias y videncias, is open to the public from December 16, 2016, at Museo Mural Diego Rivera, Balderas and Colón, on the western end of the Alameda Central, in Mexico City.